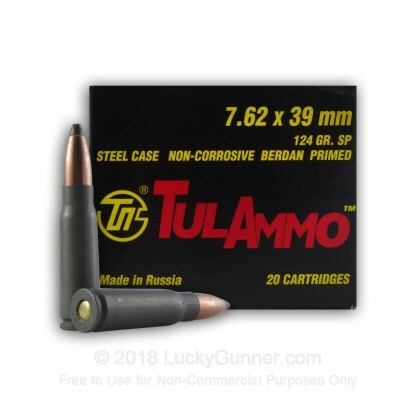 This newly manufactured 7.62x39 soft point ammunition is ideal for hunting, target practice, range training, or plinking. It is both economical and reliable and is produced by one of the most established ammunition plants in the world. This ammunition is rugged like the country where it was manufactured and keeps its qualities under temperatures ranging from -58 degrees Fahrenheit to 122 degrees Fahrenheit ensuring that it will perform when needed most. Usual thing, again and again. We all know about Tulammo stuff - especially AK caliber. When you shoot it -it goes bang and flies out the barrel. Buying from LG is always the same... You find, click to basket, cause the price is right, checkout, and in a couple of days it arrives in your house. Period. 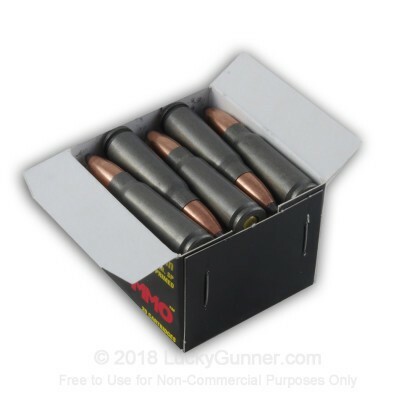 I have never heard of Luckygunner.com so was a little apprehensive at first. Once my order was placed on tuesday night it shipped the next day and arrived on friday. Fast! It arrived packaged very well no dings or dents in the packaging. I inspected a few rounds and there are all in exellent condition. Only reason I gave this a 4 on performance is because I havnt shot any from this lot yet. This brand usually runs just fine in my SKS will see in the AK. 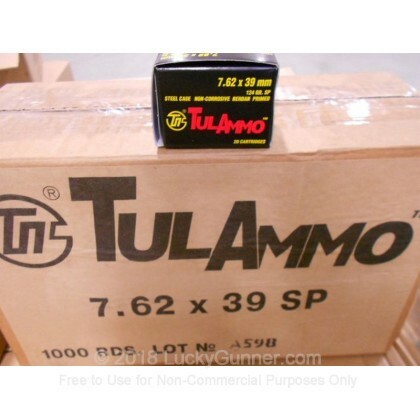 If your looking for ammo stop looking and place your orders here. Better service than the rest. Great price, and we were impressed with the performance, quality fas good too. I would definitely buy it again and recommend it to friends. 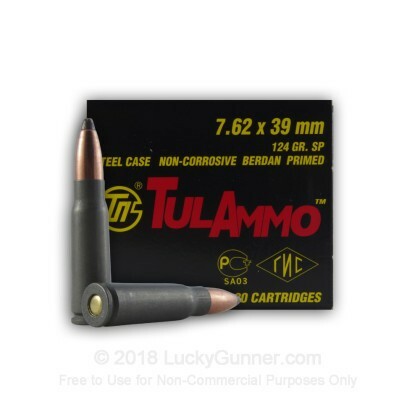 Great ammo for the price, no failures with over 5000 rds. down range.!!!! Not as clean firing as US brass ammo.!!! You get what you pay for and for my money and plinking you cannot bet Tula.!!!!! In the area I live in certain calibers are ridiculously overpriced and the 7.62x39 is one of them. Oddly enough I found it cheap locally when visiting family four hours distant, but I digress. Enter Lucky Gunner. This stuff is cheap, performs correctly, and is great for getting practice time in. Yes it's dirty, and the shells might keep you out of the local range, but the fact that it shoots when it's supposed to and is inexpensive to fire is enough to override those drawbacks. Shot from an AK-47 Cesar USA. Zero problems. My 500 rounds were 100% reliable. At half the cost to shoot as my .45 acp, it's an amazing value. It's a bit dirty to shoot and drops at anything over 100 yards, but for what it's designed for, it's the best.